I think it’s safe to say that one of the greatest conspiracy comedies of all time is the Robert De Niro/Dustin Hoffman collaboration ‘Wag the Dog’. The film depicts the lengths that unscrupulous spin-doctors will go to in pursuit of a politician’s re-election. The movie is hilarious at times but it is a clever movie throughout and it certainly makes you wonder if you should ever believe more than 50% of what you are fed through the media. I worked in a job for many years where you were advised ‘to believe half of what you saw and absolutely nothing of what you heard’. Having worked there over three decades, I fully concur with that wisdom. People will believe what best suits their interests and, sometimes, the emperor’s new clothes will pass as high fashion if the end result is the one you really want. There was always going to be controversy in the aftermath of Mayweather vs Pacquiao and the triumphant faithful would always laud their man’s victory over the ‘losers and the ‘haters’ and the downright heavy hearted. But we also knew that the spin machine would be cranked up and a litany of excuses from the real to the ridiculous would be pumped out until the audience moved on to more exciting things. In the aftermath of Mayweather’s victory, Team Pacquiao have declared that the Filipino legend was operating under an acute shoulder injury, that his mobility was greatly hampered and that this explained why the entire boxing world is asking exactly what Manny Pacquiao turned up on the night. But is there any merit in what they say or is this merely a damage limitation exercise following a poor result? Were such assertions based on fact, then surely the relevant governing bodies would have been informed and establishing the validity of the injury would fall to the bureaucrats. Today the United States Anti-Doping Agency (USADA) have confirmed that, yes indeed, they were contacted by Team Pacquiao four weeks before the fight and informed that their man had sustained a significant rotary cuff injury in training. An MRI scan was provided which showed a tear extensive enough to warrant the use of Anti-Inflammatory injections as part of a pain management treatment. The USADA also confirmed that they approved the particular treatment and all its components. It was further confirmed that the tear had halted sparring in the Pacquiao camp, that a medical team supervised Pacquiao’s progress as the fight grew near and he was subject to only light training under treatment. On the day of the fight, the Nevada State Athletic Commission was informed that Manny Pacquiao would be receiving pain killing injections prior to the bout. They were supplied with the USADA approval of the Anti-Inflammatory shots and Pacquiao prepared for the bout with his team. An official from the Commission was then tasked with informing Pacquiao that, due to the NSAC not being informed ‘in writing’ of the injury, they would not allow the pain management treatment to be administered. 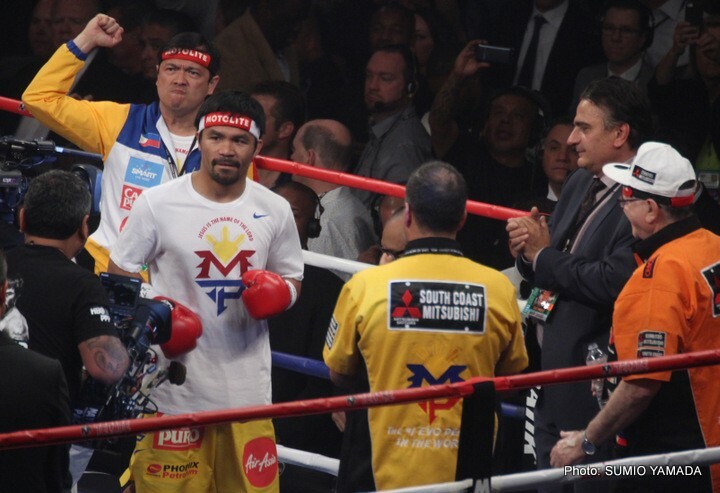 Arum immediately objected to this decision and Pacquiao’s own medical team attempted to intervene. The Commission felt that they had not been given enough time to assess the treatment…a course of Anti-Inflammatory pain management that had been entirely approved by USADA…and voiced concerns over the components of the treatment which included Lidocaine. 1.“Excuses, excuses, excuses…why did this only come out AFTER the fight?” Well, it’s been absolutely established that this issue was raging in the weeks before the fight and we only got to hear of it after the fact. 2. “If Pacquiao was so injured, why did he only ask for the injections on the day of the fight?” Manny Pacquiao was receiving Anti-Inflammatory pain management shots for almost a month before the fight under the supervision of USADA but he was only refused the treatment on the day of the fight when the NSAC got involved. To suggest that someone would experience such distress from mundane activities would give some insight into the distress a boxer would undergo in a competitive bout. 4. “If he was that badly injured, why didn’t he pull the fight?”. Pacquiao was advised to withdraw from the fight when the injury happened but said that it had taken years to make the event and he wouldn’t let his fans down. When the NSAC informed him of their decision NOT to allow the shots, Manny Pacquiao had the option to pull the fight and lodge an appeal. The NSAC noted his reply as “I respect the decision of the Commission but my shoulder is not 100%”. Pacquiao will meet with a surgeon tomorrow and a decision will be made with regards to the future but his injuries are very real and have been confirmed by all of the relevant bodies regardless of their lack of input. The following weeks will establish what happens next but there can be no doubt of what has transpired over the past few weeks. But there simply must be questions asked of the disgraceful position taken by the NSAC in the hours prior to the biggest fight in boxing history when they had already approved the use of Lidocaine for Mayweathers injuries.